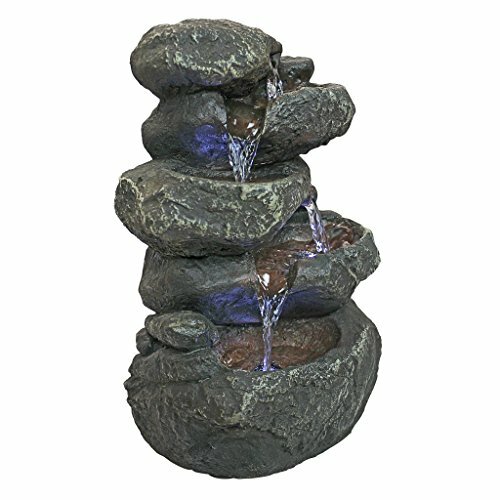 You’ll be hard pressed to find a more naturalistic garden fountain than this amazingly detailed, nearly yard-tall work of functional garden art! Tranquil water cascades across three levels of weathered boulders to empty gently into a softly illuminated pool. Cast in quality designer resin and realistically hand-painted to capture the patinas of moss-covered rocks, this Design Toscano-exclusive work creates an instantly peaceful garden sanctuary with an integrated, UL-listed, indoor/outdoor pump and low-voltage LED lights for dramatic effect. 7″Wx5½”Dx11″H. 4 lbs.